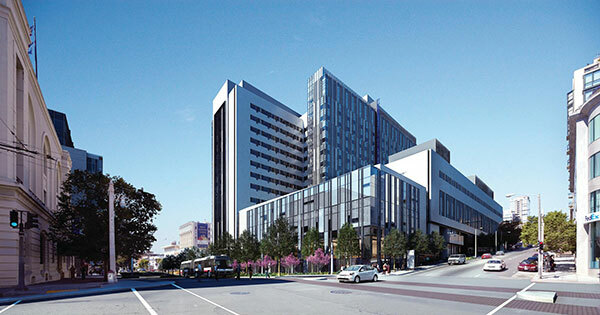 California Pacific Medical Center, a Sutter Health affiliate, is constructing its new 274 bed hospital located in the Cathedral Hill District of San Francisco, situated between Van Ness and Geary. The CPMC Van Ness and Geary Campus, is the first of three top-of-the-line medical centers scheduled to be built in the heart of San Francisco. These next generation medical campuses are aimed to serve local neighborhoods by providing easier access to health care services. The new CPMC Van Ness and Geary hospital is organized around comprehensive centers of care rather than traditional departments, enhancing the delivery of patient care while improving space efficiencies, workflow and productivity. The CPMC Van Ness and Geary hospital building is designed to meet LEED certification and the attached medical office will meet LEED Silver certification. Hospitals in general are noisy. Research has proven that a quiet hospital environment improves patient healing and medical staff satisfaction.1 The noise from equipment, patient intake and discharge areas, nursing stations, and common areas plus the regulatory requirements for patient privacy, makes having rooms designed to mitigate utmost sound transmission a critical design. The General Contractor of HerreroBoldt Partners, Acoustical Consultants Shen Milsom and Wilke (SM&W), sub contractor California Drywall, Architect SmithGroup and PABCO® Gypsum worked together to design the most cost effective medical facility that met the noise requirements designed for the projects. "QuietRock was brought to the project and received a thorough acoustical analysis from our project consultants. We found acceptable alternative details using QuietRock that met or exceeded the sound isolating industry standards i.e. Sound Transmission Class (STC) ratings using less gypsum board material. We look forward to seeing QuietRock installed in the field during project construction." Certain walls within the hospital have specific noise control requirements that need to be achieved. The acoustical consultant on the project, Shen Milsom Wilke, wanted a more conservative design. After reviewing the QuietRock® product they requested an acoustic performance test of the walls by a NVLAP-accredited laboratory. Assemblies with multiple layers of standard type X and walls built with QuietRock® EZ-SNAP were tested in a controlled environment at Western Electro-Acoustic Laboratories (WEAL) for a fair and unbiased comparison. Sound transmission between the rooms - the amount of noise that would pass between room based on the proposed wall assemblies was a concern to the team. The hospital has different acoustical requirements for the walls: STC 40, 45 and 50. STC 40 walls can easily be achieved using traditional building materials. QuietRock was reserved for use in walls where higher performance is required. STC 45 walls are used between patient rooms and walls between toilet rooms and public spaces. The initial STC 45 wall design specified the use of 3-layers of Type X gypsum and the STC 50 wall was designed to use 4-layers of Type X gypsum. However, a recent research study published in Sound and Vibration magazine indicates that 3 or 4 layers of gypsum may not be sufficient to achieve the required STC ratings for the hospital. The side-by-side testing performed at WEAL confirmed this assertion. In addition to designing for noise the integrated team also needed to address mold concerns. Breathing mold contaminated air can cause severe health affects to hospital patients, personnel and visitors. Because the campus buildings are equipped with HVAC units and pluming running through ceilings, which may increase the risk for mold growth, QuietRock® ES Mold Resistant is being used to treat areas above ceiling height. Places where mold is not a major concern, standard QuietRock® ES panels are being installed to reduce costs while maintaining STC performance. Installing gypsum panels horizontally in a “railroad” fashion is becoming a more common practice as builders look for creative ways to manage cost on the job. This technique of lining up panels horizontally on either side of the studs is believed to cut labor costs and decrease production time tables. Many builders railroad panels in corridors so that ductwork penetrations in the plenum spaces can be addressed more efficiently. Similarly, healthcare facilities prefer a railroaded install to accommodate wiring, plumbing and other devices into headwall fixtures. Not all gypsum products are approved for this type of an installation. QuietRock® has passed full fire and hose stream tests required for a railroad installation. "After completing our analysis, it was clear that QuietRock ES would be the best solution to achieve the required STC performance, at the lowest cost, for the Cathedral Hill district campus. Additionally, using QuietRock ES standardizes the wall dimension and reduces variability for other in-wall systems like door frames and receptacle outlets."